Ah, one of the best names for a product EVER! Chubby Hubby!! Ben & Jerry's have hit ice cream gold with this ice cream invention. I haven't tasted this flavour *yet* but it's not just the title that's intriguing. Check out the ingredients: chocolate covered, peanut butter filled pretzels embedded in a creamy vanilla base surrounded by ribbons of fudge and peanut butter. Temped, yet? Chubby Hubby..... Chubby everyone! I feel like I've gained 10 pounds just reading off that list! 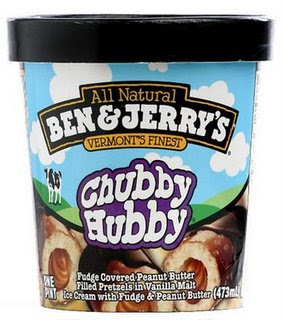 I've never seen 'Chubby Hubby' either. It looks calorific but I *must* try it! Thanks for bringing it to my attention, LTG!